Kim Hoa Industrial Zone is located in Phuc Yen commune, Vinh Phuc province with the total area of 105.5ha, of which 50 ha is for the first stage. Located next to Highway No2, bordering with Hanoi, Kim Hoa Industrial zone has a convenient transportation system. Presently, Japanese investors, including Honda and Toyota plants make their investment to the Industrial Zone. + 10 kilometres far from Noi Bai International Airport. + 17 kilometres far from National Railway. + 80 kilometres far from Hai Phong International Sea Port. a. Road: Located in the centre of Northern key economic regions” Ha Noi- Hai Phong- Quang Ninh”, the Industrial zone has many advantages on road and waterway transportation. 3. Industrial zone Infrastructure and Services. Power supply:Kim Hoa I.Z is available with power provided from Soc Son 220/110 KV and Dong Anh 110 KV Power substation, which assures to supply stable power to the fence of factories. Water supply: Investors are provided with clean water from the underground water source, which has been treated at Clean water plant with the capacity of 14.000m3 per day and night, assuring to supply clean water continuosly to the fence of factories. Communication system: Kim Hoa I.Z ’s adequate communication system, including phone, mobile phone, FAX and Internet assures for easy domestic and international communication for investors. Time necessary to provide these services is within 7-10 days. Traffic inside and outside the Industrial zone: Asphaltic concrete roads, load limits of H30, from 8 metres to 15 metres in width, sidewalks for pedestrian, lighting system and green area to make beautiful landscape for the industrial zone. Drainage system: There are 2 separate drainage systems, one for storm water and the other for industrial waste water. Primary waste water treatment shall be carried out right at the factory, then connected with Industrial zone waste water plant for centralized treatment to meet TCVN 6982:2001 standard before discharging outside. Kim Hoa Industrial zone has many advantages on import and export with Hai Phong International Seaport and Noi Bai International airport. 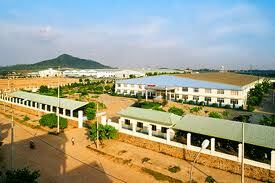 Kim Hoa I.Z is located in the Northern key economic region among Ha Noi- Hai Phong- Quang Ninh. It is advantageous for providing products for the big cities in the region and nationwide at the lowest cost. - 50-60 USD/ person/month for common labors. - Business income tax applied in the industrial zone is 25%. b. Taxation for profit overseas.Profits which foreign investors get in Viet Nam will be taxed, whether these profits are transferred abroad under the Circular No 26/2004/TT-BTC dated March 31st of Ministry of Finance. - Enterprises are exempt from import tax and VAT Tax for goods imported to be fixed assets. - Equipments, machines and material which can’t be produced in Viet Nam. - Special purpose means of transport in production line, vehicles carrying workers from 24 seats and over and attached parts, details, loose pieces and accompanying accessories, imported materials to manufacture attached parts, details, loose pieces and accompanying accessories. -Materials and loose components imported to process exports under the signed contract are exempt from the import duty. - Materials and loose components imported to process exports are import tax defferal as stipulated at Import tax Law and once exporting complete products, remission of import taxes for the imported materials are calculated at the rate eligible for the proportion of exported complete products. In the time of remission of import taxes, VAT payment is temporarily delayed. - Selling goods produced from imported materials to other enterprises for direct production for exports will be tax rebated, including import tax and VAT, eligible for the amount of imported goods. © 2011Copyright IDICO Urban and Industrial Zone Development Company Limited. 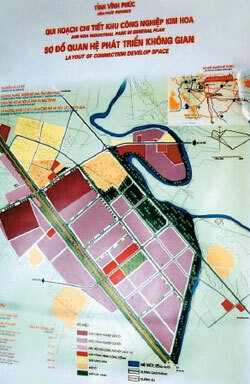 Địa chỉ: Industrial Zone Nhon Trach 1, Nhon Trach District, Dong Nai Province, Viet Nam.